By 36 weeks of pregnancy it is all about labour and the delivery of your baby. At the end of this week your pregnancy will be considered full term which is great news for the birth of your little one. A full term pregnancy lasts anywhere from 37 to 42 weeks. A baby born before 37 weeks is considered premature while after 42 weeks is post-term. You will find however that most obstetricians will not let a pregnancy go post-term like they did years ago. Once it was not uncommon for a baby to be born 2 weeks late, although now intervention is used to bring on labour. You may be anxious about when your baby will be born, well from the end of this week it could be any day! While your baby may be born close to your original due date, only 5% of babies are delivered on the actual date. Your obstetrician may request you to have blood tests at 36 weeks of pregnancy to check your progress, this will most likely be the last test you will have. From this week on your weekly visits to your OB or midwife may include checking your cervix (as explained in week 35 of pregnancy in this guide). However remember that you just never know when your baby will be born. A baby with its head engaged, and the cervix partially effaced and a few centimeters dilated may in fact remain in you right up to your due date despite all these signs that your baby is ready to be born. It is also not uncommon for a woman with a “closed” cervix one day to go into labour the next. It is just a waiting game where anything can happen so be prepared! Have Your Car Seat or Capsule Installed to Bring Home Your Precious Cargo. There are a few things that you should ensure are ready for the birth of your baby such as having your hospital bag packed and ready to go. 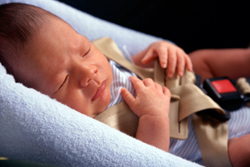 Ensure you have a car seat or capsule properly installed in your car to bring your precious cargo home. If you haven’t already, you may wish to become familiar with the hospital you are planning to give birth at by taking a hospital tour. Hospital tours are often part of your antenatal classes. However if that isn’t the case for your particular hospital, why not request a tour? It can put your mind at ease and feel much more confident about the delivery of your baby if you know where it is going to happen and the facilities available to you. At 36 weeks of pregnancy you may be feeling very uncomfortable with your uterus being the largest it has ever been and sitting up under your ribcage! Luckily you may soon have some relief from lightening or engagement as your baby drops down into your pelvis. Pregnancy is the only time where your body will face this many changes in your life time. It is incredible to think that your uterus will return to normal within 6 weeks following the birth of your baby! Taking Naps During the Day Will Help You to Catch Up on Lost Sleep. Despite your lack of comfort at this stage of pregnancy, do your best to get as much rest as possible. You may be feeling very tired as you head into these last few weeks and remember there is not going to be much time to catch up on sleep once your baby arrives and is demanding your attention. It may be difficult to get a good nights sleep between the pressure on your bladder, your growing tummy, swelling and cramping. If you are not getting a good nights sleep, try taking naps throughout the day to catch up where possible. Putting on Weight is Your Baby's Number One Priority. It may not seem very exciting but by this stage of pregnancy your baby’s main job is to continue putting on weight. Weight gain is a very important for your baby when outside the womb especially for regulating body temperature and developing immunity to some of the nasty bugs in the outside world. Your baby weighs approximately 2.7kgs and is about 45cms from head to toe at 36 weeks of pregnancy. Putting on about 28 grams a day, your baby’s face has rounded out and fat begins to fill out on the elbows and knees, plus forming creases in your baby’s neck and wrists. You have to love a cute, chubby little newborn baby and they will just continue to grow more and more after birth. Researchers are Still Unsure of What Brings on Labour. Interestingly no-one knows just what tigers your body to go into labour, however researchers have a variety of theories as to what might prompt delivery. Some believe that your baby sends a message via their brain to the fetal adrenal glands. Hormones are then produced by these glands to stimulate the altered production of estrogen and progesterone, communicating to your body that it is time to go into labour. Others believe that it could be related to your baby’s lungs secreting signals or hormones letting your body know that they are ready to join us as they are now mature enough to survive. In conjunction with this, prostaglandin’s (that play a key role in labour and delivery) are said to trigger labour by preparing the cervix for delivery after certain enzymes result in their release. Maybe one day we will know exactly what happens and if in fact our baby communicates with our body to say “look out here I come!” Until then we will just be left guessing, waiting for the arrival of our precious baby.